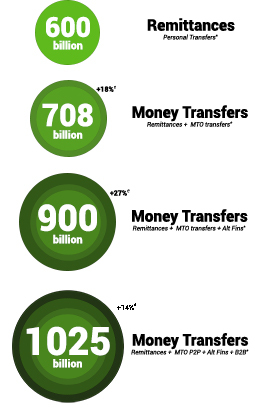 For IMTC WORLD in Miami this past November, I decided to present my estimates on the size of the international Money Transfer and X-Border Payments industry, coming to a figure of approximately 1,025 billion USD, based on private communications with industry players and my own analysis (INFOGRAPHIC). The estimate starts from the 600B estimated by the World Bank on Remittance Volumes and adds estimates on unreported remittances, x-border money transfers that don’t fall in the strict “remittance” category (see definition below) and B2B & B2C transfers handled by the industry, by companies using Hawala-Type Methods and newcomers using VCs . If you want some detail about how this estimate was calculated, please read below or download this PDF to read. Estimating the size of the remittance market has been a pursuit of many multilateral agencies such as the Interamerican Development Bank (for volumes to Latin America), CEMLA (Centro de Estudios Latinoamericanos), The Interamerican Dialogue, Eurostat (volumes in and out of Europe) and the World Bank, working with data collected from Central Banks, some from reports requested to the industry and some from estimations on Balance of Payments data. For many years I have presented the World Bank estimates as the only estimates that were reliable enough to show as industry figures. But after the financial crisis and the increase in digital payments, fintechs coming into the picture and industry players diversifying their services & products, it became evident that remittance volumes and international money transfers & payments volumes were distancing themselves. Although worldwide remittances have been growing in the last decade (see chart), volumes of industry players were increasing much more. And the closing of smaller players by compliance costs and derisking could not account for the increase. In several meetings in the past two years I came to the conclusion that we needed a better estimate. But I never thought it was going to be so difficult. And it will get harder as Bitcoin and other VCs increase their transactional volume as international transfers, either used as P2P, B2P, P2B or B2B. Let’s first go into the glossary of terms being used so we have a better understanding of what we are talking about. Remittances: It is important to understand that the World Bank defines remittances as the sum of two main components: “compensation of employees” and “personal transfers” and the main source for data on remittance inflows and outflows is the International Monetary Fund (IMF) Balance of Payments (BoP) database and secondary sources of remittance data are the websites of countries’ central banks or statistical offices. Most Central Banks are able to collect this information but there is significant heterogeneity in the quality of remittance data compilation across countries. Some countries collect it but do not publish it for many reasons, mostly political in nature. The United States, as the number one remittances originator, makes an estimation of the volume that has been criticized and was part of a US Government Accountability Office (GAO) Report on 2016  that made evident the disagreement between GAO and Bureau of Economic Analysis (BEA) over US remittance data estimates.The World Bank projected the worldwide volume of remittances for 2017 to reach 596 Billion . These “non-payment connected”, free donations to family or friends, are remittances.As part of remittance data, Compensation of Employees “represents remuneration in return for the labor input to the production process contributed by an individual in an employer-employee relationship with the enterprise.” But the distinction between appears “compensation of employees” and “personal transfers” is believed to be entirely arbitrary, depending on country preference, convenience, and tax laws or data availability. Airtime (top-ups) and Bill Payments: The Airtime industry which provides the ability of anyone to “top-up” the prepaid account of almost any phone around the world has been linked to the international money transfer industry since its beginnings when calling cards were sold at all money transfer agents in the developed world. Estimates of the size of this market is around 20B per year . The Bill Payment industry grew out of the Airtime industry, allowing anyone to pay a bill internationally, offline or online. Migrants in many countries increasingly use the service instead of sending funds to family members to pay for those bills. Are they remittances? Some purists might discuss if they are or not, since not all of those transactions are not-payment connected donations. In-Kind Remittances: Migrants have always sent packages home with goods and presents, instead of sending remittances, mostly during Holidays and special occasions. Some might travel with these goods and Christmas Season at the US-Mexico border is a spectacle of migrants going home with truckloads of goods & gifts. The estimate for Mexico on Cash taken & in-kind remittances are less than 2% or close to 0.5 Billion. Some countries think those volumes are negligible but bribed custom officials in many borders (and airports) know that this is not the case. Large number of “suitcases” are usually seen rushed-out of airports in Latin America (Guatemala, Salvador, Honduras, as an example). Trade-Related transfers: Connected to these “in-kind transfers” are trade-related transfers which are happening with the increase amounts of packages sent by migrants to family members back home. Merchandise, instead of remittances, are sent to family members who become salesmen (door-to-door or street vendors) and continue their trade by sending money back to purchase more merchandise. These funds are handled by Money Transfer Companies as they are small and, if asked by regulatory requirements, they are declared as family support, never as a payment. Hawala: Stigmatized for many years as the way for illegal funds to move across the world, Hawala has regained popularity with the increase use of Virtual Currencies. This informal money transfer system popular in the Middle East, North Africa, and South Asia that dates back to the Middle Ages is alive and as long as Hawalars are not handling “dirty money”, local law enforcement let them provide their services, vital to many countries and towns. Hawala works by transferring value (money) without actually moving it. Is money transfer without money movement by “compensation” or “netting” funds on both sides of the transaction . Banks and licensed MTOs providing the same type of services (with the burden of compliance, locations, taxes, etc) have helped law enforcement on the control of Hawalars. But digital services have begun a reappearance of Hawala-type services were people or businesses in different sides of the world can settle without funds ever moving from one country to the other, but settled locally (see more below). DeriskingThe closing (or not opening) of bank accounts by financial institutions as a way to avoid the risk associated with providing banking services to a law-abiding sector of the economy. Derisking has been used as an excuse to stifle competition and for political and/or economic reasons.... want more? : DeriskingThe closing (or not opening) of bank accounts by financial institutions as a way to avoid the risk associated with providing banking services to a law-abiding sector of the economy. Derisking has been used as an excuse to stifle competition and for political and/or economic reasons.... want more?, Unbanking or Refusal to Supply Banking Services, has been described by the World Bank and FATF as “a phenomenon of financial institutions terminating or restricting business relationships with clients or categories of clients to avoid, rather than manage, risk.” This worldwide phenomenon has caused many money transfer companies to find new ways of managing funds outside the banking system or avoiding international wire transfers provided by banks. Reporting of flows, therefore might be jeopardized. The Migration and Development Brief 28 – October 2017 The World Bank Group – Knomad http://bit.ly/2kFTjnb publishes an Appendix (pags. 33-35) with an analysis of the collection and estimation of remittance flows. 2) People-People Matching: A digital service in the US let’s you place a buy or sell for funds in a certain country based on funds in the US. The service uses an escrow-type of service to secure the transaction in one or each of the ends and funds are never transferred internationally. Local Bitcoins, an internet service, matches people buying & selling VCs and the exchange of funds is done, locally or internationally. 4) Need-based Matching: A person sells its home in Caracas and needs the funds in USD. A person/business receives the funds and pays out remittances until the funds are used in its entirety in Venezuela and the recipient in the US collects those funds. These service is used in many countries were controls exist of exchange differential through formal methods are large. 5) Netting by MTOs: DeriskingThe closing (or not opening) of bank accounts by financial institutions as a way to avoid the risk associated with providing banking services to a law-abiding sector of the economy. Derisking has been used as an excuse to stifle competition and for political and/or economic reasons.... want more?, the cost of international wires by banks, the increase in banking costs, restriction by banks on MSB Banking and restriction on international wires have led to an increase in services by aggregators, by foreign exchange firms settling domestically or finding ways to settle funds through third parties by “triangulation”. Triangulation means in this context the netting between three parties (or more) instead of two. Step 3: I have estimated that on top of the 708B, a 27% should be added from the volume of international money transfers done using VCs, both for personal as well as business related transfers, netting by MTOs and traditional Hawala and modern Hawala services. Here we add the flow of international money transfers that are trade-related and that use the same existing remittance rails. This adds a total of 192 Billion USD for a total of 900 Billion. Some of my colleagues feel that I have underestimated the volume of Hawala transfers and they might be right. I just hope that better estimates come forward approving or disapproving my estimates and moving this conversation forward. It will be extremely beneficial if these estimates are done in a country by country basis, with the knowledge of local markets by local or regional experts. Step 4: Last but not least, I have estimated that on top of the 900B we need to add 14% for the B2B international money transfers that the industry is now increasingly managing, either by offering these services parallel to their remittance services, opening new companies serving business transfers as well as the new fintechs that are managing B2B both as regular FOREX services traditional do or by using VCs. Flows moving from Banks to MTOs? It is a fact that online money transfer operators, who have been increasing the volume of international money transfers at a vast pace, believe that the users of their services come, to a large extent, from the banking sector. How many customers are moving from the brick & mortar space into the digital space and are using digital MTOs is a question that was debated in the past IMTC WORLD with very interesting points of view presented by the panelists. Unless some of these bank transfers in the different countries are counted in the remittance data, these volumes are not part of my estimates. It is important to mention that ease of use of x-border transfers increases volumes (or makes those transfers more formal in nature) as it has been exemplified in Africa where x-border mobile wallet services will undoubtedly increase the flow of funds for all types of uses, remittance or not in nature.